36' Steel Yard Ramp with 25,000 lb capacity. Width 96". Used for loading and unloading freight. For use with Rail Cars, Loading Docks and Trailers. The Model 25SYS9636L includes a six foot level off at the end of the ramp which adds maneuverability for forklifts. This allows them to handle pallets next to the door openings. 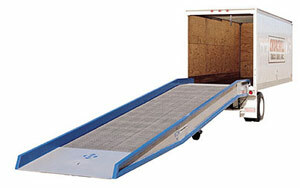 The 36' ramp is most popular where end-loading is required.